Michelangelo Merisi da Caravaggio arrived in Malta on July 12, 1607 after being forced to flee Naples for once again causing trouble. It is believed he might have traveled to Malta with the Knights of Malta’s galley squadron which were commanded by Fabrizio Sforza Colonna, the son of the Marquis of Caravaggio. Malta was the headquarters for the Knights of Malta, Order of St. John, and according to Caravaggio’s early biographers the artist immediately began painting portraits of the highest ranking Knights including Alof de Wignacourt, the Grand Master. 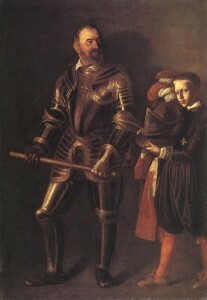 Caravaggio’s Portrait of Alof de Wignacourt and his Page portrays the Grand Master in his shiny formal black and gold Milanese armor and holding his baton at the ready. In the portrait we also see a young page apparently standing next to the Grand Master. It is believed that the page might have been Nicholas de Paris Boissy, a French aristocrat from a noble Catholic family. Wignacourt had successfully guided the Knights into becoming a sovereign power subject only to the Pope, making himself a sort of prince. 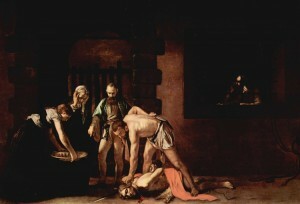 Due to this status, it is believed that Caravaggio was hoping that Wignacourt’s patronage could be of assistance in securing a pardon for the death of Tomassoni. If this was the case, he was right. Grand Master Wignacourt used his clout and wrote to the Pope to obtain a pardon for Caravaggio. Wignacourt was impressed to have such a famous artist acting as the official painter of the Order so he inducted him as a knight. On July 14, 1608, Caravaggio was welcomed into the Order as Knight of Obedience. While in the service of the Knights, Caravaggio painted not only a number of portraits of the leading knights but he also painted his huge Beheading of Saint John the Baptist, the only painting signed by the artist, and the famous, St Jerome Writing. Caravaggio’s good standing didn’t last long. By late August of 1608 the artist was once again in prison. The circumstances surrounding the situation are questionable. It is believed that some sort of insult to a knight, possibly being seriously wounded after the door of his house was beaten down, was the cause of the imprisonment. On October 6, 1608, Caravaggio managed to escape prison and the Grand Master ordered that he be captured. By December 1 of that year, Caravaggio was expelled from the order and stripped of his knighthood. 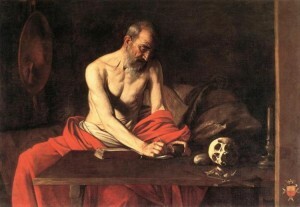 Caravaggio managed to make his was to Sicily.